Fraud during the holidays is always something to be on the lookout for. 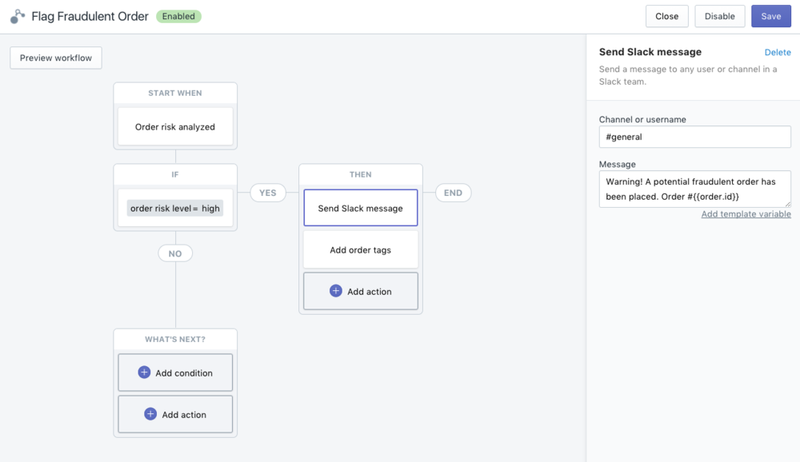 Luckily, with Shopify Flow you can automatically run risk analysis on orders as they come through and receive alerts about potential risky orders. Who doesn’t like receiving a nice not every once in awhile? With Shopify Flow, you can setup a trigger that auto-tags customers who have made multiple purchases from your store. Using these tags, you can identify some of your top customers and include a nice personal thank you note or special gift. The holiday’s can be the busiest time of the year for most stores, but returns and refunds also tend to high. Using a Shopify Flow that can track high dollar refunds can be a great way to keep a pulse on problem products or unsatisfied customers. Leverage Klavyio or Mailchimp to create targeted email campaigns for specific customer segments using Shopify Flow. One of our clients recently opened a new store in Chicago and wanted to create a transactional email that was sent to new customers that lived near the store. To make this possible, we created Shopify Flow that auto tagged customers that lived in Illinois. Using that info, we then created a new transactional email in Mailchimp that sent a welcome email to the customers that matched the customer tag letting them know about the new Chicago store. Missing out on sales because a product runs out of stock can kill your holiday sales. We know it can be hard to keep track of the inventory for all the products and variants in your store, which is why creating this Shopify Flow is perfect for the holidays. You can set your lower inventory limit for when you want to be alerted about a specific product and then be automatically alerted through email or Slack. There is obviously so much more you can do with Flow, so we recommend installing and implementing workflows right away. If you're already a Shopify Plus merchant, reach out to your Merchant Success Manager for help getting started with Flow. If you're not currently using Shopify Plus, reach out to our team and we can talk through Flow and other benefits it offers merchants.